Life is full of miracles, big and small. 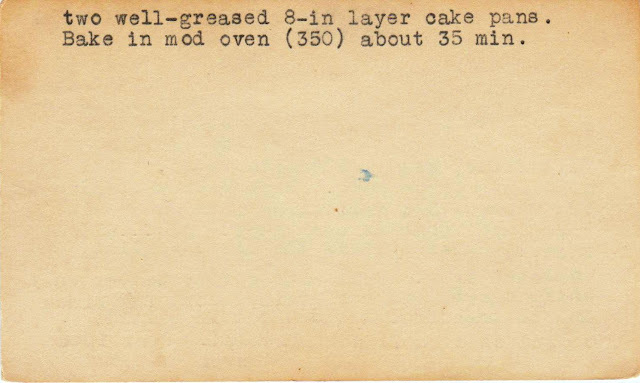 Unfortunately, this cake recipe is not among them. 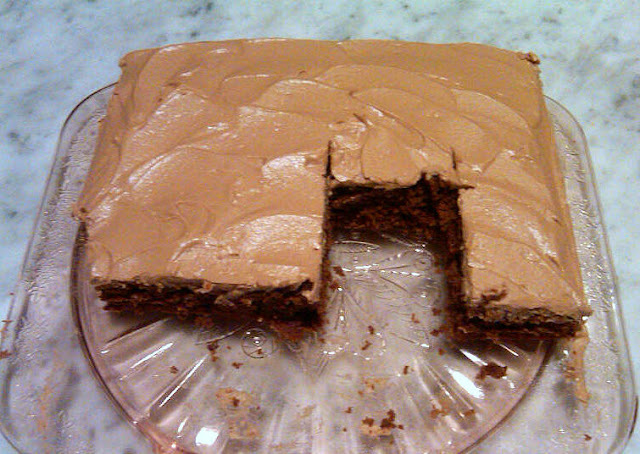 Now, this is a perfectly fine chocolate cake recipe, but a miracle shortcut it ain't. In fact the only shortcut I could see is that one need not wait for the butter to soften. Instead, the cold butter is "cut in" to the flour, similar to the method for making pie crust. 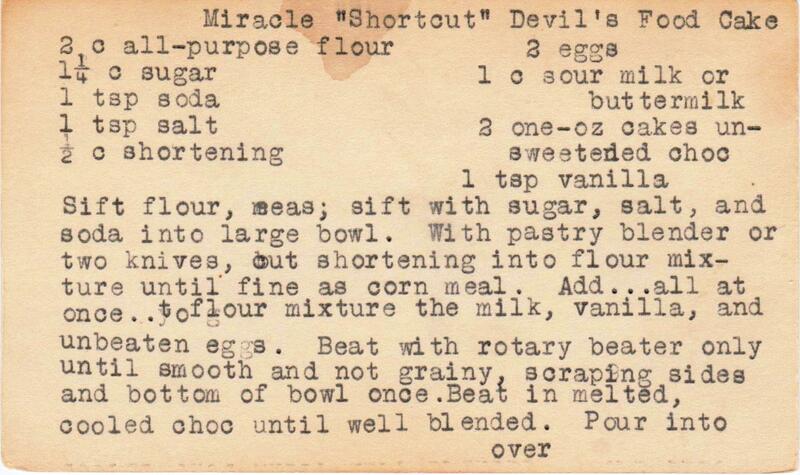 What I found most interesting -- and why I made this -- is the idea that even back in the day, housewives were searching out miracles, and shortcuts. I imagine that this baker had a true eureka moment when boxed cake mixes debuted. If you want try for a miracle, instructions are below. 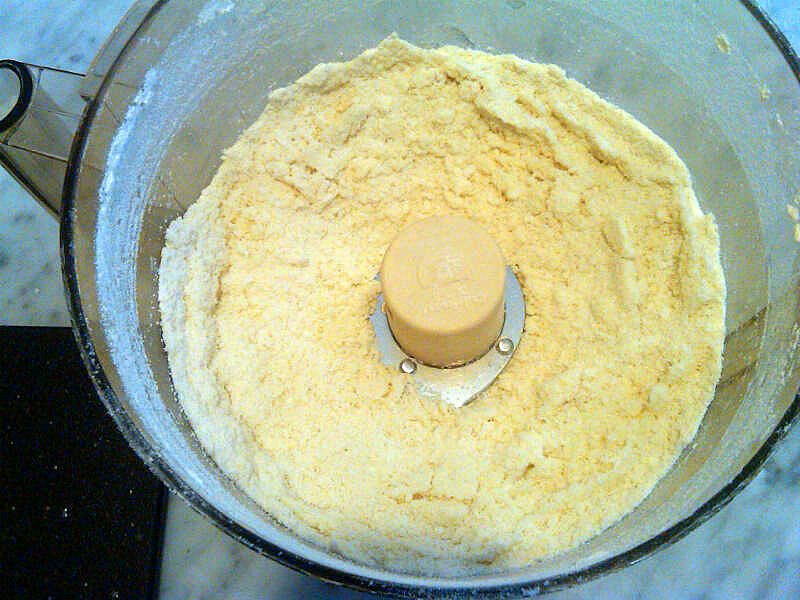 These days, I use a food processor to cut the fat into the flour. It makes short work of a tedious process, which is kind of a miracle right there. 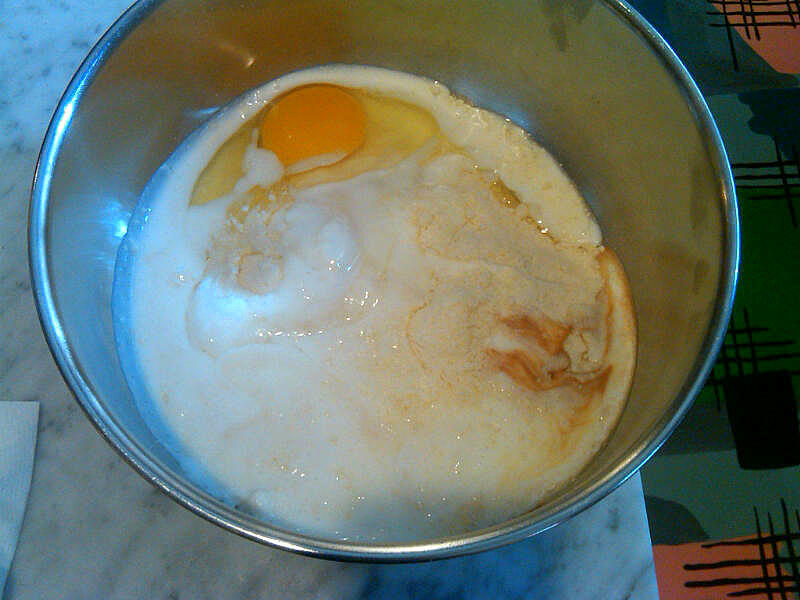 Add the liquid ingredients all at once. 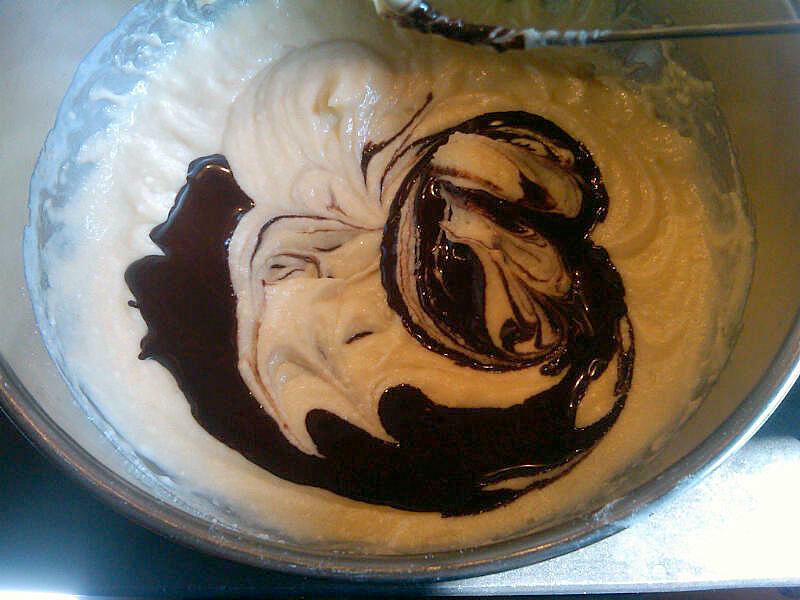 Next, add the melted chocolate. I frosted this with a mocha chocolate frosting, left over from another baking adventure. 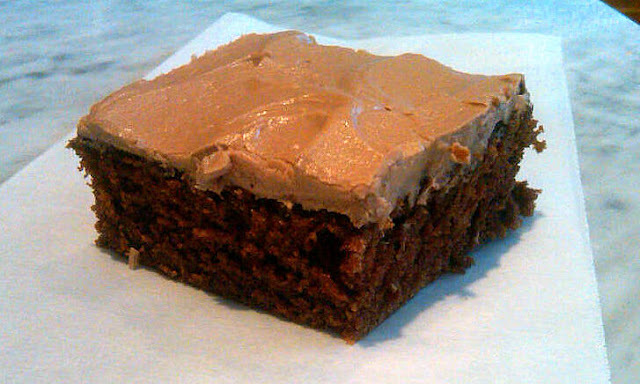 You can make your own by making this recipe from the Magnolia Bakery, adding cocoa powder and brewed coffee to taste. hello, Susan! what a great blog. my introduction to your wonderful 're-invention' of these grand old recipes was through the March 2012 issue of Ladies Home Journal!!! how appropriate is that magazine for your vintage recipe collection?!? Thanks so much for providing us with great dessert recipes that bring back old memories and help us create new ones. 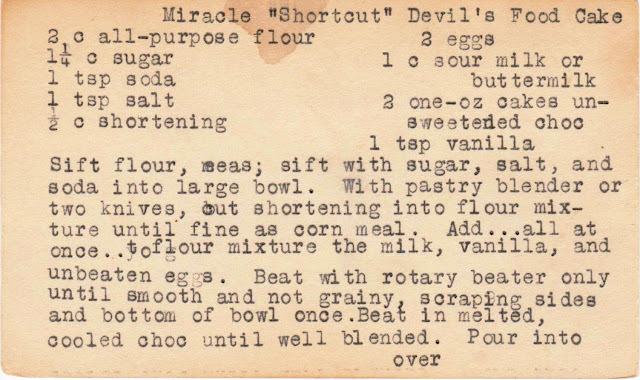 your substitution of butter for shortening is a Godsend for me (allergic to soy, in any form) in the devil's food cake recipe. this will be a great cake for Father's Day next month. Thanks so much, Kentucky cook! Yes, I'm a big believer in butter. Plus, the shortening used in these recipes is not the same shortening available today, ever since Crisco reformulated to remove the transfats. So why not use something delicious like butter instead? Good luck baking the cake! Thanks, Jeanee. I love your blog (and am in awe of your creativity). Thanks for writing.